Hoggatt Law Office, P.C. 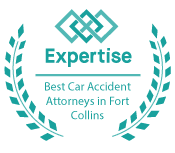 has been representing injured victims in Lafayette, Colorado and the surrounding region for more than 15 years. Our skilled attorneys provide skilled, responsible legal guidance to those who have been injured in all types of accidents, including motor vehicle accidents and accidents at work. As a small law firm, we become personally invested in each client and case that we take on. We believe that this is not only the right thing to do but also a large part of our firm’s success. By taking the time to get to know you, we are able to fully understand your needs, goals, and priorities, all of which are important in building your case for maximum compensation under the law. Our client-focused approach has helped us secure many favorable outcomes for our friends and neighbors in Boulder County, and we are ready to put our knowledge and skills to work for you. Like many communities in northern Colorado, the Lafayette area plays host to companies that operate within the state’s oil and gas industry. The extraction of oil and gas can be a dangerous process and hundreds of workers in the industry are injured each year. The team at Hoggatt Law Office, P.C. is proud to help injured oil and gas workers seek benefits under Colorado’s workers’ compensation system. Injuries caused by the failure of mechanical equipment. Time can be a factor in workers’ compensation cases, so if you have been injured at work, contact us immediately to get the help you need. If you have ever been in a car accident, you probably know how challenging it can be to get the insurance companies to pay for the damage to your vehicle. When an accident results in injured victims, insurers may be even more hesitant to pay. At Hoggatt Law Office, P.C., we understand the games that insurance companies will play to limit or avoid their financial responsibilities, and we will help you put a stop to them. While we recognize the importance of good faith settlement negotiations with defendants and their insurance companies, we prepare as if every case is headed for trial. If trial is necessary, our team includes skilled litigators who will fight on your behalf in the courtroom. If you have been injured in any type of accident, contact our office to discuss your available options. Call 970-225-2190 for a free, no-obligation consultation today. Hoggatt Law Office, P.C. serves clients in Lafayette, Boulder County, and throughout northern Colorado.